My fifth grade group has been learning about probability for the past few weeks. Our class discussion have revolved around probability trees and likelihood concepts. The summative assessment on probability is coming up around the corner so last week I was scouring my resources to find a way to review some of the concepts taught earlier in the unit. One of my colleagues and I had a conversation about the idea of using a menu board. I heard of using them through #msmathchat but haven’t used them much. I’ve always thought that giving students a choice in their assignments matters. 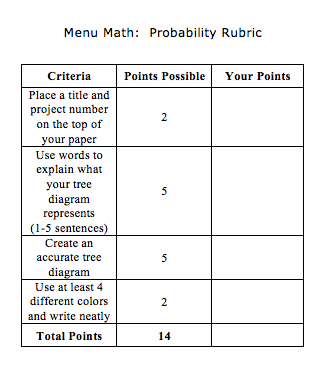 I feel like an assignment menu encourages student choice and often increases engagement. 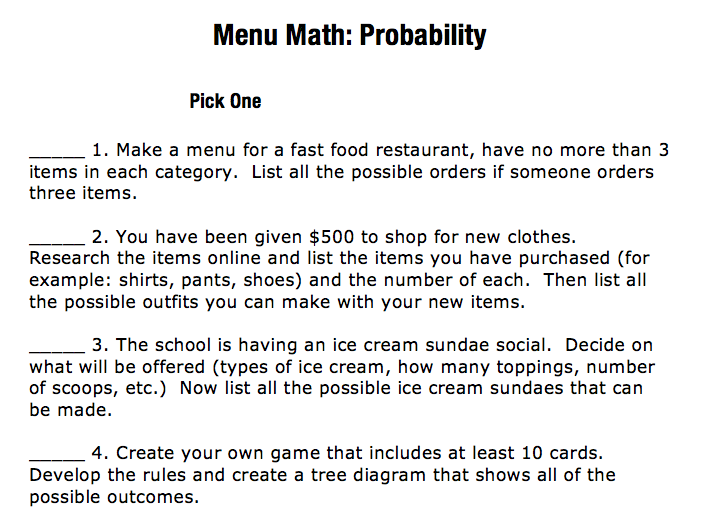 So I found a probability menu resource and decided to use it with my fifth grade crew. I added a rubric and a few other options to Yuliana’s template. Here is the template that I adapted and used for this project. Students need time to brainstorm before creating. I had a few students that immediately started working on their project just to throw it out five minutes later. These particular students didn’t brainstorm or organize their ideas before starting a final copy. On the opposite end, I had students that took out scratch paper and started to write out a few ideas before carefully crafting their project. Students need checkpoints along the way. Throughout the project I had to remind students to check the rubric and generally check-in with students to answer questions and provide feedback. During this time I also had to ensure that I had the technology in my classroom ie. iPads and computers. Next time I assign a similar project I’m thinking of having students fill out a work log to help keep us all on time. Students need time. They need time to put together their thoughts, create and produce a product that follows the minimum guidelines. Some of the students took around two class periods while others took longer. Ensuring that other assignments are in place after the project is important. Having additional work afterwards is important. It also helps eliminate the dreaded “what do I do next?” questions. Review the projects. I reviewed each project with the students. I tried to limit my own talking, which was difficult, and let the students explain their project. During that time I filled out the rubric with the student. The time spent discussing the student project was vital. Students came ready to speak to me on what they created and what they thought was important. Some of the student projects were amazing and other projects needed a bit more work. The majority of students put a decent amount of effort into the project and met the minimum criteria. This project took a good amount of time and had students create a product that was aligned with different probability standards. I thought it was worth the time and I’d like to bring out the project at some point next year.